Seeing the new version of Karate Kid movie directed by Harald Zwart and produced by Will and Jada Pinkett Smith is in many ways a deeply rewarding experience and a charming and exciting visit to China. Not least because of the spectacular landscape shots up on the mountains, the majestic Great Wall or the very narrow alleys, the warm and sympathetic description of the real people of Beijing, the delicately involved elements of great cultures, Eastern and Western, exotic Orient with fried scorpions, problems with chopsticks, mysterious cobras or truly superb filming of amazing martial art scenes. In my opinion Wenwen Han with that yellow violin case shines as the pearl of this movie and brings with her to it much needed grace and beauty to balance the raw violence and male fighting. Jaden Smith is so believable as Dre Parker that we can feel in our own bones his growth from a brave but physically weak school boy to a skilled martial arts fighter with real muscle. We see this not as an act with stuntmen doing the jumping but as a real thing: it seems that during the filming Jaden actually learned real kung fu and actually grows and develops physically from scene to scene. I have always liked Jackie Chan - as millions do for his unique blend of humanity, fierce fighting and humour - but this is a different role for him: as Mister Han he conveys the simplicity, humility and wisdom that characterize a true Master who has also studied in the school of life. Zhenwei Wang as the bully Cheng is totally believable and we learn to understand him as a kind of victim of Master Li (Yu Rongguang) and the ah so common misuse of martial arts on the streets. Wenwen brings the charming Chinese culture, politeness, sensibility, family values and amazing musical and other gifts of these people to the movie in the most graceful way hopefully inspiring many modern American girls about what is important in life and how the first date should go! The dominant theme - underdog winning the fight - is so genuinely American that movie after movie has made Box Office history with it. Not least Sylvester Stallone as Rocky. The bad guy - good guy setting and its development is very familiar to our western minds but is probably universally human. The way the students of Master Li respect Mister Han at the end is in my mind as genuinely Chinese as it is American. 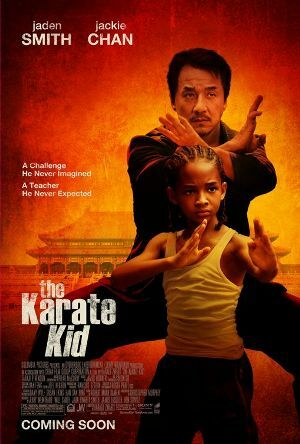 The humanistic values at the heart of the Karate Kid movie rest mainly on the shoulders of Mister "Kung fu is everywhere" Han. Actor Jackie Chan is genuinely both East and West, a real oriental person who knows the USA better than his own pockets. The combination works in a surprisingly fine and subtle way in this movie, for example in the way he walks. I think the message brought by Mister Han and his student Drek Parrett is inspiring to all growing boys and their sometimes overprotective, sometimes despairing mothers around the world! Great Wall kept the barbarians from China. Great movies build bridges between East and West for the benefit of both!